David Munson was officially installed as the 10th president of RIT on Thursday. 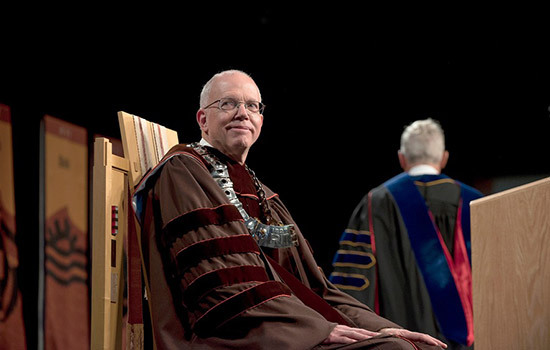 Today’s Rochester Institute of Technology is clearly different from the school created in the 19th century, and RIT must continue to evolve to help solve the challenges facing society now and in the future, David Munson told hundreds gathered Sept. 28 to witness his inauguration as the university’s 10th president. Hundreds from the RIT community, including more than 40 college and university leaders from throughout the nation, attended the ceremony in the Gordon Field House and Activities Center. Hundreds more viewed the event online. In line with Munson’s renowned appreciation for the performing arts, the ceremony featured interludes of traditional Japanese drumming from Wadaiko Rochester Taiko and a poem from Sam Finston, a game design and development major and member of RIT’s Mental Graffiti group. Dartmouth College President Philip Hanlon served as keynote speaker for the inauguration. Hanlon, who worked closely with Munson at the University of Michigan, looked toward Munson’s past to make predictions about the future for RIT. Hanlon and Munson also quipped about RIT’s School for American Crafts, which found its permanent home at RIT in 1950—after originally being founded at Dartmouth College in the 1940s. “I have no idea how we let that happen, but clearly, RIT is all the richer for it,” said Hanlon. “Phil, I do have to ask—have you got anything else for us?” replied Munson. Munson was officially installed as president by Christine Whitman, chair of the RIT Board of Trustees, and vice chairs Jeff Harris ’75 (photographic science and instrumentation), Susan Holliday ’85 (business administration) and Donald Truesdale ’87 (business administration finance). Munson also praised RIT’s excellence in technology, art and design, while encouraging the community to work across disciplines to help solve the most pressing issues of our time. Read Munson’s full remarks here. Read Hanlon’s full remarks here. Go to the RIT YouTube channel to watch the full inauguration ceremony for President Munson. To learn more about Munson, go to rit.edu/president.